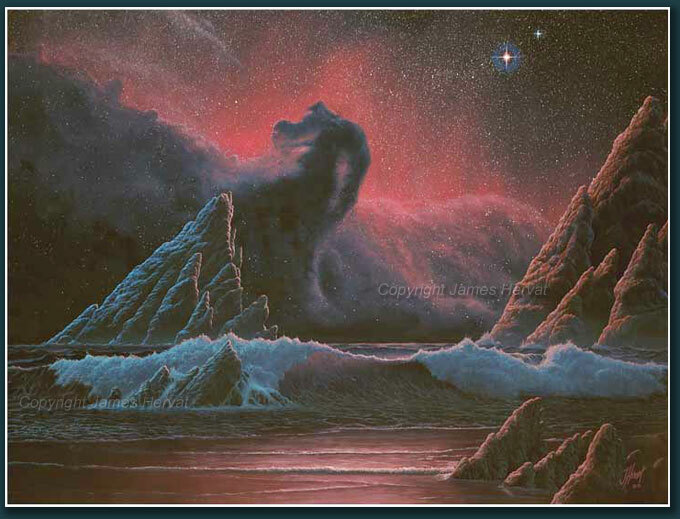 Dark Curtain by James Hervat - The Horsehead Nebula glows over crashing waves of an alien ocean planet. Dark Curtain (1996) - The familiar Horsehead Nebula hangs like a menacing thunderhead over the shoreline of an alien planet. This fanciful scene borrows the Horsehead's appearance as seen in long-exposure photos taken through large telescopes. The backdrop of glowing hydrogen--depicted bright enough here to cast shadows--would actually be all but invisible, even from such a close vantage point.